Hope is what you get when you realize that a different worldview is possible, a worldview in which the rich and the powerful, and the unscrupulous do not after all have the last word.- N. T. Wright. Several years ago, I went to the Holy Land Experience amusement park in Orlando--which I think is now closing down. It's a strange place, to be honest. I'm not sure just how much of the amusement park itself is representative of the Holy Land... but it's an experience, so there's that. Yes. 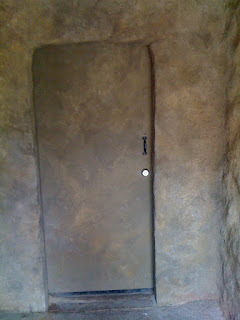 That is a door in the back of the Empty Tomb. I have used this before in a sermon, but it's just too good to not use again. 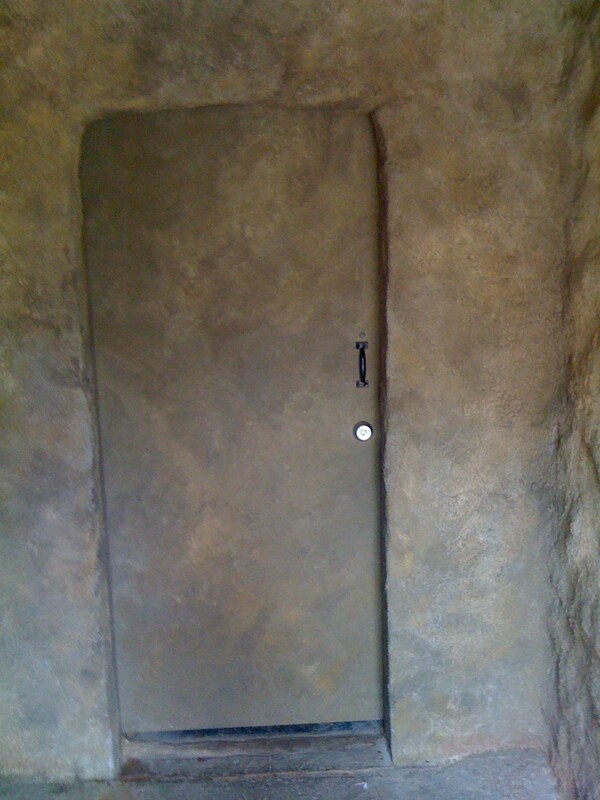 I can't tell you how many deep theological problems this back door to the Empty Tomb creates. But there it is. I've had the opportunity to go on three different pilgrimages to the actual Holy Land in Israel, and am preparing to leave for a fourth trip in two days. As part of the trips I lead, we visit an area just outside of the Old City of Jerusalem that is believed by many to be the site of the garden where Jesus was buried in a borrowed tomb. It is definitely a first century garden, with a first century tomb in it. Just in case you were wondering... there was no back door to this tomb. One is made out of stuff you can buy at Lowes, and has a back door so that the actor playing Jesus during the Passion Play at the Holy Land Experience can be buried, and then reappear in risen glory on top of the hill just behind it. It's awesome. I waited to sit it in 100 degree heat with no shade. Then there is the other tomb, which could very well be the actual tomb that Jesus was buried in after he was taken down off of the cross... This one was carved out of the solid rock in the hillside bordering the garden. And both of these tombs have something in common--believe it or not. Some people wonder about the certainty of that statement. And they wonder if it really happened. Maybe you're one of those people. You cane here today because someone asked you, or bribed you. Or maybe you sort of enjoy church, you like the atmosphere, and all--but you don't know whether you buy the whole thing or not. Or maybe you do believe or at least you think you do...but you're having a hard time convincing yourself that everything the Bible says happened...actually happened. I get it. It's hard to accept miraculous stories--even ones that are passed down from generation to generation and upon which an entire belief system is based. But... how do you explain what it feels like to see your child born? Or the love of your life on your wedding day? Or an evening with friends that is so perfect that it just defies explanation? Or that moment when you should have died... should have taken that other job... Only you didn't. And everything changed because of that moment. Do you try to find reasons... Or do you whisper, "That--was--miraculous." and find yourself okay with believing it as you say it? But you get it, don't you? You've may have had dreams that have died. You may be in a dead end career. Maybe you've had relationships lose their life and come to an end. Perhaps you've seen the demise of your finances through a bad economy or bad decisions. Or maybe you see your future as buried in darkness--with a stone rolled in front of it. And what you long for more than anything else is for new life... for a miracle... for resurrection. You want to believe that all of the bad stuff, the brokenness of this world, the evil that seems to get the upper hand more than it should... you want to believe that it doesn't get to win. And I'm here to tell you that it doesn't. Because of this story we're celebrating today... it doesn't. I want you to hold on to this one thing---don't forget this, write it down, underline it. It's important--perhaps the most important thing you'll ever hear. Evil doesn't get the last word, God does and the last word is RISEN. I love what the author of John's Gospel does here---the world is still in darkness, but the light is beginning to dawn, just enough so that Mary can see the stone is rolled away. 3 So Peter and the other disciple started for the tomb. 4 Both were running, but the other disciple outran Peter and reached the tomb first. 5 He bent over and looked in at the strips of linen lying there but did not go in. Mary did not come to the tomb expecting resurrection--no one did. And she's so distraught with grief that she can't seem to recognize the fact that the two figures in white inside the tomb were angels. All it takes is one word from Jesus and she sees everything differently. Just as Jesus said, "My sheep hear my voice..."
She calls him "My Rabbi"
Isn't it interesting that the predominant emotions on the first Easter were not certainty and unbridled hope? Instead, the disciples were filled with fear. One of the most frequent things that Jesus says to his disciples after the Resurrection is "Do not be afraid." There's a reason for that. They weren't exactly sure what had happened, but they knew that somehow everything was going to change for them. The Resurrection is about how everything is different. The fact that Jesus is loose in the world should give us all pause. Jesus didn't simply say challenging things that are neatly packaged in dusty, old pages where we can ignore them if we so choose. The Resurrection assures us that Jesus is saying things right now. The Resurrection assures us that Jesus is risen, at work in Creation reconciling it to God, redeeming it, reclaiming it...saving it. Sometimes I can almost hear the whisper of the voice of Christ. It's like the whole word is speaking it, breathing the words in and out--despite our best efforts to drown it out with our noise, with our shrill, warring voices, our machinery, our pollution...our busy-ness and self-centered racket. My friend went to a prestigious aerospace engineering school and spent five years getting his engineering degree. He spurned offers of six-figure salaries to become a campus minister, who has to raise his own support. This is what he told me, anyway. What he was really saying was, "Risen." I was in downtown Chicago and a young woman entered the deli where I was buying a cup of coffee accompanied by a filthy, homeless man who exuded shame and the smell of the street. "Order what you want." she told him. What she was really saying was, "Risen." A parishoner came up to me and told me. "I don't know why, but I feel like God wants me to minister to people who are divorced or single parents." Another came to me and told me that he was feeling led to begin a food ministry in our church. "I feel like this may be what God wants me to do with the rest of my life," he said. What they were really saying was, "Risen." Whenever we hear people speak words of peace in the middle of conflict. Wherever there is the sound of swords being beaten into plowshares. When we hear it, when we really hear the whispering--we know what it is. We are like Mary, who, when hearing her own name spoken by the Savior, knows the voice. But we have to be small enough, quiet enough, broken enough to listen. When it finally comes to us, we have to have the courage to admit that everything is going to be different from now on--now that we have heard. When Jesus appears before him at last and invites Thomas to believe, he says, "Come here with your finger, and inspect my hands; come here with your hand, and put it into my side. Do not be faithless, but believe." Thomas does not touch him. There is no need. 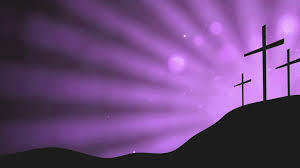 And what he heard was, "Risen." If you take away the resurrection there is no gospel---no reason to even show up here today. If you try to explain the resurrection of Jesus away, to cast it into doubt it might very well create a safer belief system. But if your religion is too safe--it isn't good news. We don't need safe right now. We need miraculous.